I've noticed a new blog that has undertaken a worthy project. It's going to present us with a catalog of flies, with pictures, and with recipes. This is noble and I wish Alex good luck and God speed. So far he's given us five categories of flies, with a sixth on the way. I've chosen a fly from each and illustrated them below. For the Complete story you can go to Fly Pattern Database. Just click on his pictures for the recipe. 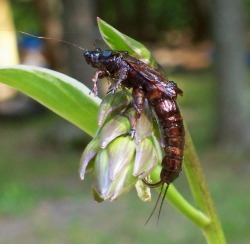 This E-Z Hopper is listed as the Michigan Skunk. When You click on his picture a 404 error pops up. Boy I remember the problems with my first try at peck and click. Anyway the fly looks nice. From the looks of this pattern, I'd be proud to catch the fly, even if I didn't catch the fish. This is Day Trippers Bead Bodied Scud. 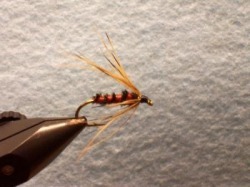 I suppose that this anadromous fly will catch anadromous fish. This pattern is called Joe Mama's Squid. It's big and beautiful. Now this is a real gem. I'd eat it myself if I could. I just wish that the instructions included some tips on just how to do the intricate steps that must be involved.